QUINCY, Mass. 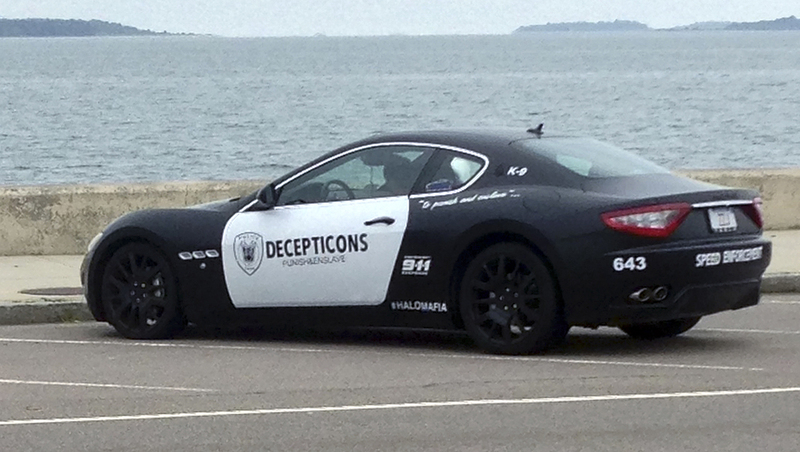 -- A Massachusetts man charged with impersonating an officer for driving a Maserati that resembled a police cruiser is off the hook. The Patriot Ledger reports that a clerk magistrate in Quincy District Court on Thursday dismissed the charge, saying 23-year-old Zhang Zhijun, of Braintree, hadn't taken any actions such as pulling over other drivers. Zhijun was cited on Aug. 9 when police pulled him over. He wasn't arrested. He had decorated his luxury Italian sportscar to look like the character Barricade from the "Transformers" movies. It was painted black and white with a police-style shield on the doors, and police-related decals. The shield was accompanied by the phrase "Decepticons punish and enslave," from the movie. The car did not have flashing blue lights.